Even if you are alone at home and can’t technically “Netflix and Chill” with your significant other, that doesn’t mean that you can’t watch movies alone! In fact, a very popular activity that women take part in when home alone is to watch movies (and even TV shows) in the comfort of their own home. However, while this may sound like a simple endeavor to accomplish, there are a lot of factors that you should consider to not just watch your favorites, but to really immerse yourself in the entire experience. Watching movies and TV shows from the comfort of your own home should be an immersive experience. Before you even begin to think about taking your home theater game to the next level, you need to have a solid “library” of movies and TV shows that is available for you to choose from. Hopefully at the very least you have a modest collection of good movies to start with. If not, it is quite easy to go out to your nearest convenience store and purchase a few movies that you’ve either never seen before, or that you thoroughly enjoyed and would love to see again (or multiple times). In fact, you can even make it a habit to purchase a few movies every month or so, after purchasing the groceries or doing any other regular shopping activities. Another great way to increase your library is to subscribe in streaming services such as Netflix or Amazon Prime. Not only do they provide a constantly updating library of TV shows and movies, but they store all their media online, meaning that you don’t need to have a huge shelf set aside for all the TV shows and movies you want to watch. Perhaps just a smaller shelf for your own personal movie collection and you are good! The only downside to streaming services is that they cost a monthly subscription fee. However, the subscription fee is worth it if you use the streaming services regularly (at least a couple of times per week). Once you have the media ready for you to select and start watching, you need to ensure that you create a space that is conducive not just to watching TV shows and movies, but also one that helps you to relax and unwind as a general therapeutic activity. To start, make sure that you select a TV screen that is large enough for your needs. Typically, this means as large as possible, but, you can work with smaller screens if you physically situate yourself closer to them accordingly. In fact, if you really don’t have an adequate TV to work with, you can watch all your favorite media directly from your laptop! On a side note – the sound system that you use for your “home theater” does not need to be super fancy. I do suggest not using headphones to get the full stereo experience, but you do not need to splurge on an extra fancy and expensive sound system. The regular TV (or laptop) speakers will typically do just fine. Next, make sure that you find a nice, comfortable seating arrangement. The most ideal seat is a full-sized couch, which is typically available if you are using a full-sized TV in the living room. However, if your TV is situated in the bedroom, you can lay in bed as well – just make sure that you don’t end up falling asleep while watching! With a laptop, you are free to setup wherever you want, but our one big piece of advice is to set the laptop on a (separate) hard surface such as a table or a night stand. This way there is no chance for your laptop to move around while you are moving around on the couch or bed. 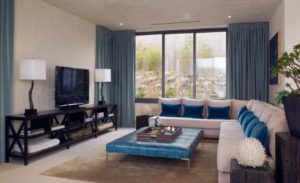 Always make sure that your TV is big enough for you, and that your seating arrangement is comfortable enough for you as well. In terms of lighting, it is totally up to you – if you want to create a movie theater like experience, then just dim the lights (or lower the shades if you are watching during the day). Again, all of this is with the goal of making yourself the most comfortable, so just do what makes you feel the best. No good movie or TV show experience is complete without something to munch on while watching. 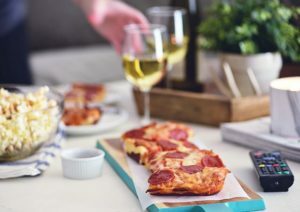 However, while at the movie you may be limited to (expensive) snack items like popcorn and nachos, at home you have the freedom to make whatever you want. So if you want to make some popcorn for yourself, then go for it! Or you could even cook something up more akin to a full dinner to really hold you over during the movie. Just keep in mind that whatever you cook up for yourself, it should not only be easy to make, but also something that is easy to eat. If you end up cooking something too difficult, then it often ends up tiring you out a bit, detracting you from the enjoyment of watching your TV show or movie itself. And it is important to make your food easy to eat because the worst thing you can do while watching your entertainment is to have to spend a couple of seconds staring down at your food to cut or otherwise prep your food for each individual bite, potentially missing out on something important in the plot. Keep it simple so you can keep all your attention on the movie or TV show at hand! If you really want to cook something substantial, sort type of pasta is usually a good choice for something that is not only easy to make, but easy to eat as well! Whatever you decide on eating during your movie, make sure it is not only easy to make, but easy to eat as well. Make your Movies and TV Shows an Experience! 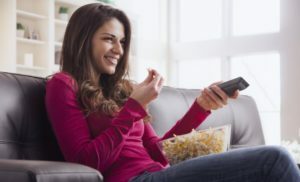 Watching your favorite TV shows and movies is not just about the media itself, but about the total experience, from where you sit down to watch, to what food you indulge on while watching. It’s easy to just pop in a DVD and sit through a movie, but unless you truly make an experience out of it, you’ll often feel empty two hours later once the movie finishes. However, if you follow our tips above, every time you kick back and relax with a movie or TV show, you’ll really be enjoying yourself to the absolute fullest!